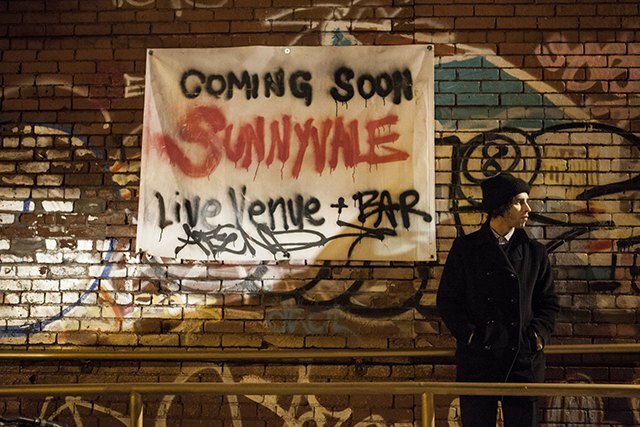 A unique East Williamsburg bar and performance venue called Sunnyvale held its grand opening party this past Saturday. Located at 1031 Grand Street, the name is a nod to the Canadian television show Trailer Park Boys, but it's not a themed bar. The name came about after hours of debate when the suggestion "Sunnyvale" finally ended it. It's a fun reference for those who get it, but otherwise subtle enough for one to take whatever meaning one wants from it. Sunnyvale is jointly owned by six friends, two of whom gave Bushwick Daily a preview of the space: Tim Pioppo, who is responsible for booking the talent, and John Conor Brook, the bar manager. The group has big plans for their spot, which successfully came to fruition Saturday evening. 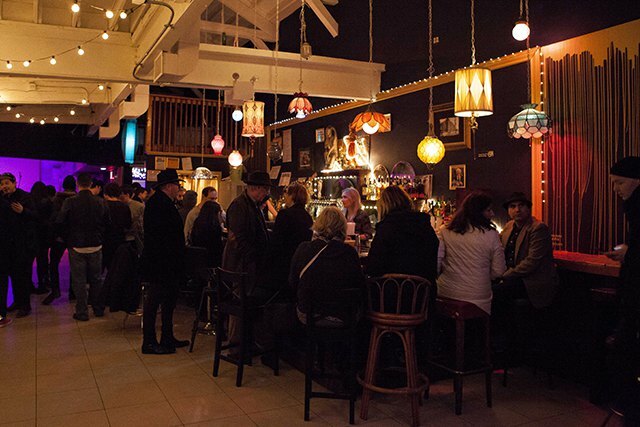 Equipped with a state of the art sound system comprised in part of two vintage Myers speakers, Sunnyvale will host bands, djs, drag shows karaoke and much more: there's something on the schedule every night. 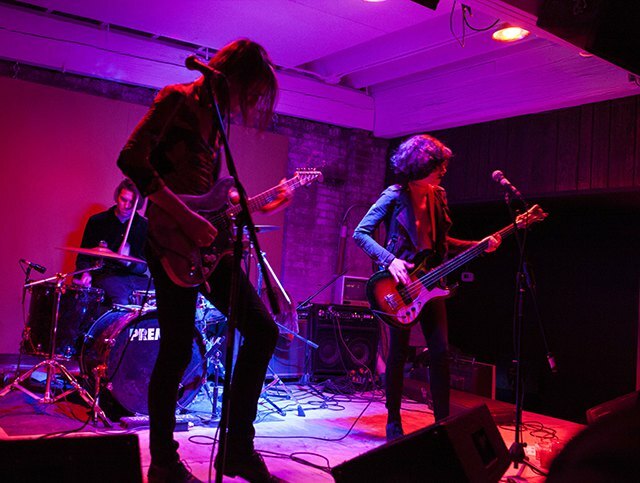 Pioppo describes the place as "a professional bar with the heart of a DIY venue", and it definitely has the feel of a warehouse venue. The space itself was the boiler room of an old paper and lithography company building, and it stands on a row of functioning industrial buildings between Morgan Avenue and Vandervoort Avenue a few blocks away from venues Shea Stadium, The Acheron and the Paper Box. Many aspects of Sunnyvale make it unique, from the management, to the drinks, to the decor. Their cocktail menu isn't huge at the moment, but it is innovative. Brook has worked in the industry in Manhattan for years so he's applying expert knowledge, but he's clearly enjoying himself. One of the cocktails, the "Hocktail", containing Calico Jack rum, lime juice, soda, and Sriracha "no joke came to [John] in a dream". Another noteworthy option is the "I am the Liquor": on the menu, where its ingredients should be listed, it reads "¯\_(ツ)_/¯". Let's just say it's strong. Orange soda is definitely one of the ingredients. They plan for an almost-nightly themed cocktail inspired by whatever is going on that evening. You can also expect food service in the coming months. Exactly what is yet to be decided, the possibility of "pickles, pretzels, and empanadas" were suggested. While this 2,500+ square foot venue has a DIY feel, the partners did put thought and effort into the decor. The actual bar was handmade by their contractor and partner Jesse Greene. None of the bar stools, furniture, or lights hanging overhead match. They are all vintage, sourced from here or there whenever one of the guys saw something that struck their fancy. It's an eclectic mix of cool finds, which complements "what we were going for with the entertainment selection". During the months leading up to the opening, the place was their "dustcloud of stress", as Tim puts it. Their opening party on Saturday was the night it all came together. Pre-sale tickets completely sold out and the place was at capacity. Doors opened at 8 and guests started arriving immediately. The first act, Lodro, came on shortly before 10pm, followed by Genesis P-Orridge & Edley ODowd of Psychic TV, then Oberhofer, and finally a DJ set by Cassie Ramone, formerly of the Vivian Girls. This is a venue where anything goes, which was made clear by its wildly successful opening. There's not really another place to which it can be compared, so keep an eye out for some awesome things happening at Sunnyvale. Sunnyvale is located at 1031 Grand Street, open every day from 5pm to 4am with hours subject to change based on event.